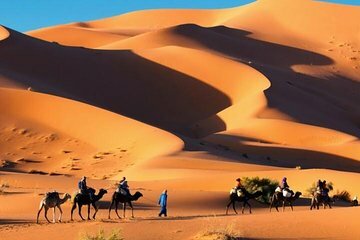 For desert wanderers who wish to experience an overnight Bedouin camp, this 3-day tour offers a premium experience in the Sahara Desert. Watch the sunset over the Erg Chebbi dunes near Merzouga after crossing the Atlas Mountains via Tizi-n-Tichka pass. Getting around can be tricky, so let a guide accompany you to the UNESCO-listed Aït Benhaddou kasbah, the desert oasis at Skoura, and the Kasbah of Ouarzazate—all round-trip from Marrakech.